You are at:Home»Arts/Entertainment»Sports»Where Do The Vikings Go From Here? Now that Vikings’ fans have had plenty of time to cool off from their team’s unfortunate playoff loss, there are many things the team has to consider now that we’re less than a week from the Super Bowl. The Vikings’ playoff loss isn’t one easily forgotten and fans of the squad can only push through to next year after the ample coverage of the devastating defeat. Heading into the offseason, the main question is, what comes next for the Vikings? The defense has markedly improved in two years under Zimmer. The year before his arrival, the team had the worst scoring defense in the league. The Vikings have moved up to 11th and 5th in the two years since. The overall youth of the team. Three rookies were named to the All-Rookie team (LB Eric Kendricks, WR Stefon Diggs and DE Danielle Hunter), and four of our five Pro-Bowlers are 28 or younger (Peterson is the old man of the group). 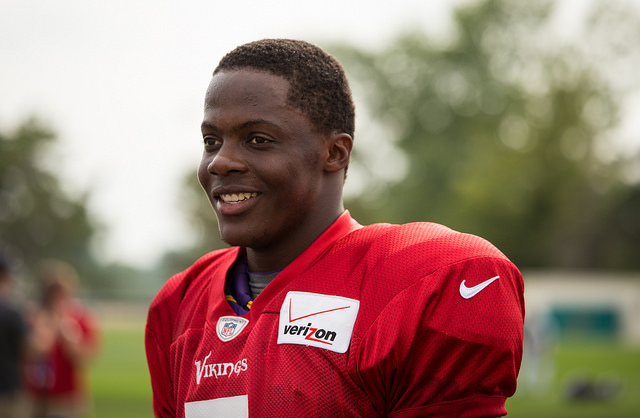 Harrison Smith got an interception and Teddy Bridgewater threw two touchdowns in the Pro Bowl. The other rookies also contributed throughout the year when called upon. No major free agents are set to leave the team. The most important would be LB Chad Greenway, CB Terence Newman, S Andrew Sendejo and I’d probably toss RB Matt Asiata on there as well. So far, some of the offseason moves have been intriguing. Former University of Northern Iowa receiver and 4.19-second 40-yard dash runner Terrell Sinkfield signed a reserve/futures contract along with former Golden Gopher Isaac Fruechte and others. The few older players, such as Brian Robison and Chad Greenway, are on the backside of their careers. Luckily, Greenway’s versatility paid dividends throughout the year. Both players also have successors in the wings. The Vikings already fired last year’s offensive line coach Jeff Davidson and replaced him with former Miami Dolphin’s head coach Tony Sparano. Fans saw pressure on Teddy Bridgewater throughout the season, which led to quite a few hits on the young quarterback. Shuffling in coaching staff. Kirby Wilson, running backs coach, left the team for a position with the Cleveland Browns. Former Browns head coach Pat Shurmur becomes the Vikings tight end coach while last years TE coach Kevin Stefanski shifts to running backs. Adrian Peterson. You wouldn’t normally list the leading rusher in the league as a work in progress, but his continued fumbling issues (especially in key situations) have been devastating. It’s no good when you have a hard time trusting your best player with the ball in key situations. 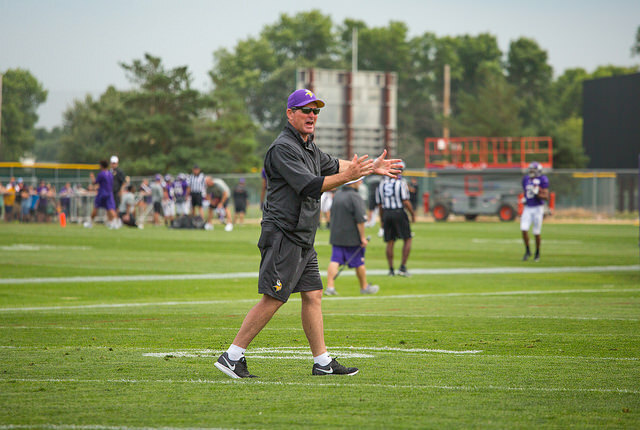 The Vikings improved further than most were expecting in Zimmer’s second year at the helm. The team made great strides and although they struggled against the better competition in the league, they won a majority of games they were supposed to. They also got their signature win in the season finale against the Green Bay Packers to take the division. Next year for the team to stick out as the real deal, there will have to be definite improvement.